Today’s destination is the Catinaccio group, more specifically the Vajolet towers. 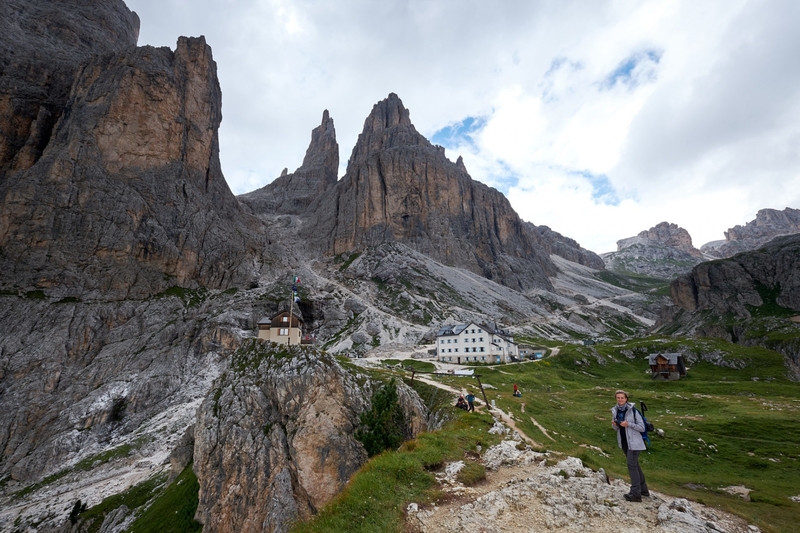 This location is one of the most iconic of the Dolomites, yet not as crowded as the others. 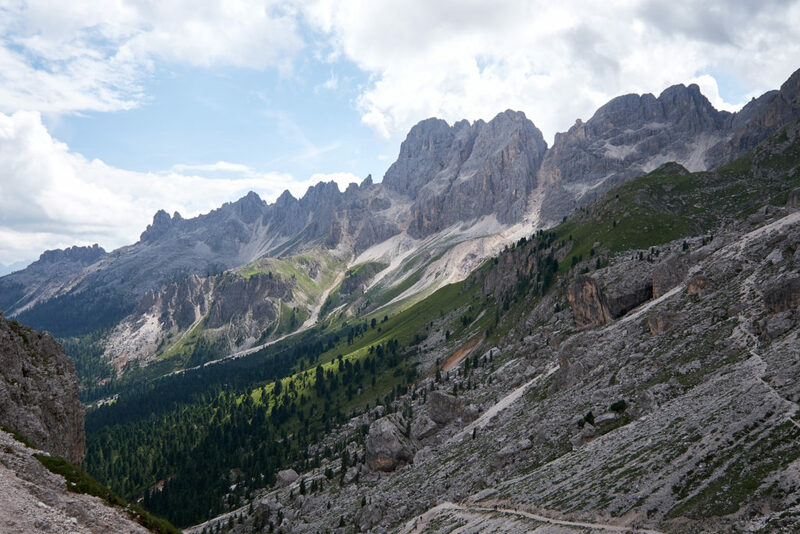 It is located about one hour drive from La Villa, where our apartment is located, but the road to get to the starting point (Pozza di Fassa) if far from being boring as it crosses the Gardena Pass and the Sella Pass, as well as Corvara and Canazei, small towns well known to skiers for their abundance of ski trails and the connection to the Dolomiti Superski Area. 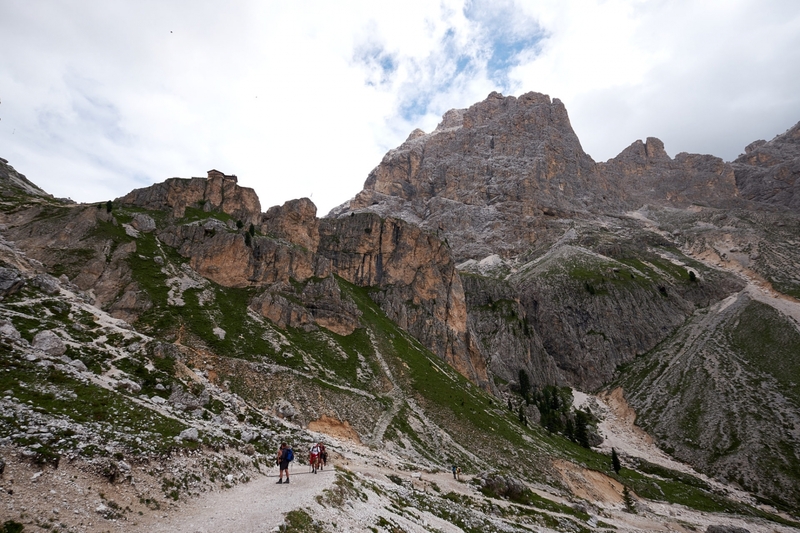 A small shuttle bus brings us from Pozza di Fassa (approx. 1350 mt. above sea level) to Rifugio Gardeccia (1949 mt. above sea level) through a road that is nothing special (taking the bus was definitely a good decision). From Rifugio Gardeccia a white trail start going up. Towards Rifugio Vajolet and Rifugio Preuss, two mountain hoots located one in front of the other at approx. 2245 mt. above sea level. 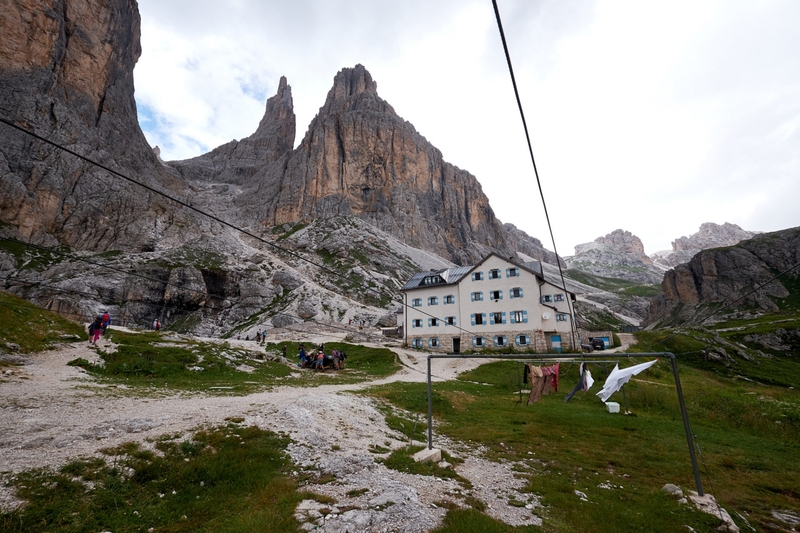 Getting there is our first stage in today’s plan, as our final destination should be Rifugio Re Alberto Primo (2621mt. above sea level), located right below the Vajolet towers. The trail is easy, steep at times, but definitely easier that the one we walked in the past days. It is also fairly short, less than 3 kilometers, but the view is still spectacular, despite the presence of clouds and flat light that doesn’t help taking pictures. 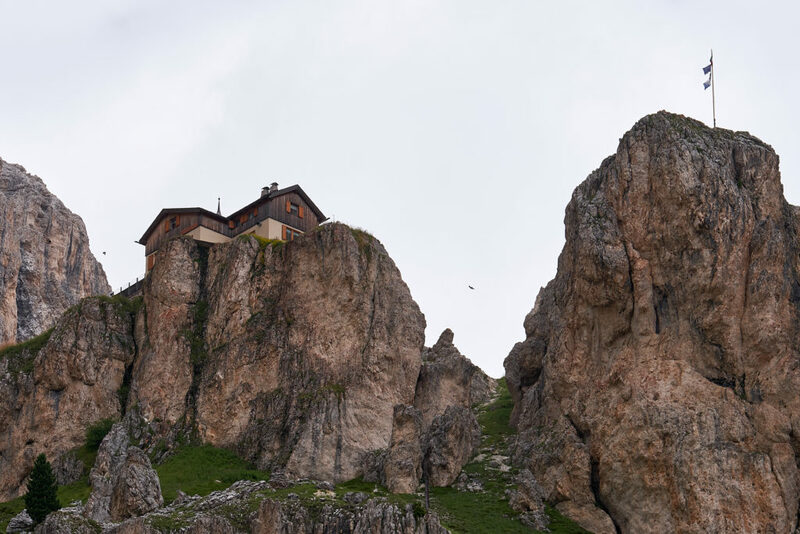 While walking we easily spot the first hoot (It’s Rifugio Preuss, but we don’t know it yet) it’s right above us, built on top of a rock that is somehow intimidating from below. This is one of those things that always surprise us. The mountain hoot locations are often “crazy”, it’s something like “how did they decide to build a hoot here?”. That’s what makes these hoots special. The view, the feeling of being almost flying in between these wonderful mountains. 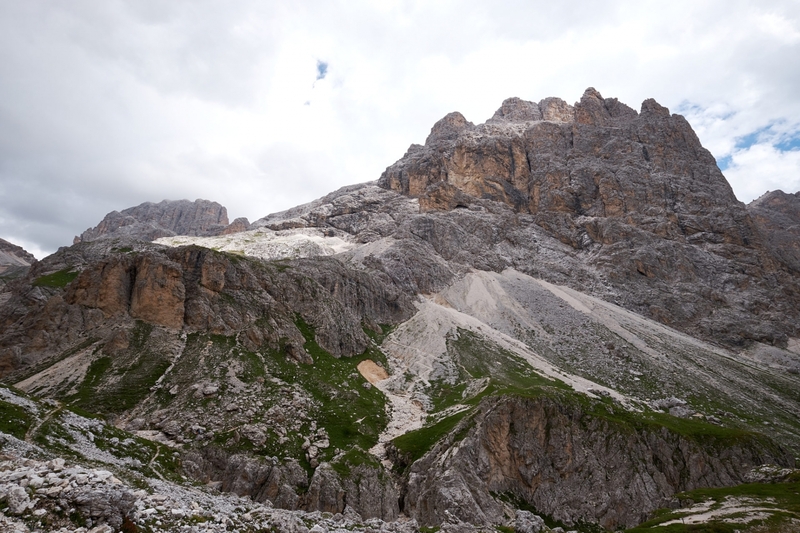 However, in less than an hour we finally get to Rifugio Preuss and Rifugio Vajolet (they’re literally in front of each other, less than 50 meters distant). It’s a bit too early for lunch but, at the same time, we don’t know if we are going to be able to get to our final destination. On one hand weather forecast don’t seem to be optimistic, on the other hand the trail to get to Rifugio Re Alberto Primo begins with a such an indication: “Only for expert hikers”. It’s the first time we see this indication, it kind of surprises us. We see others going for the path but they seem far from being comfortable with it. This, together with the potential for rain (remember yesterday? We don’t want that to happen again) seem to suggest us not go further, as a difficult path may become very hard with rain, especially when descending the mountain. We spend some time taking pictures in the plateau, and then have lunch with our sandwiches. 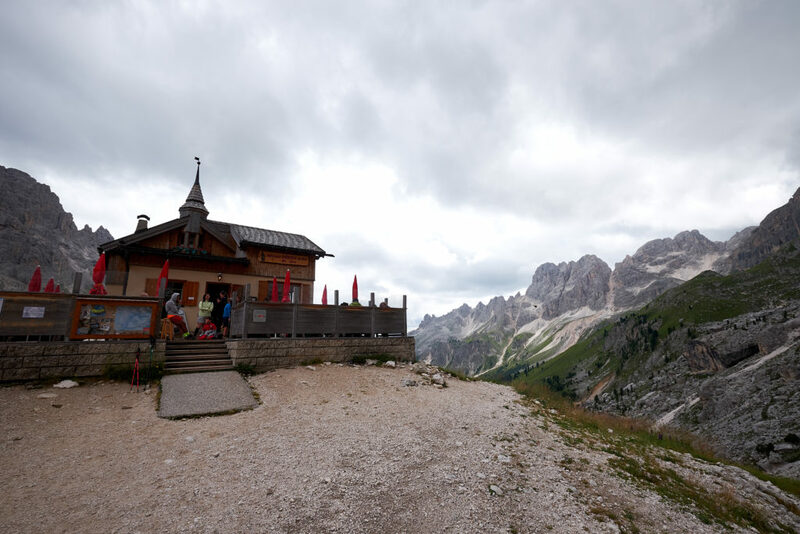 Due to the change of plans, we have time to sit at Rifugio Vajolet (the one you see in the opening picture) and have a cake for us. While approaching the hoot a heavy rain shower hits us, and we have to run to the hoot to seek for shelter. Our plan for the cake did not change, so we sit outside, protected by a huge umbrella, and have a very good cake. When the rain is over, we decide to walk back to our starting point, Rifugio Gardeccia, to take the shuttle bus and get back to the car. While walking weather seems to become better and better, so we ask ourselves where we can go to make the most out of the day. The choice is obvious, we’re too close to Carezza to pass on this. 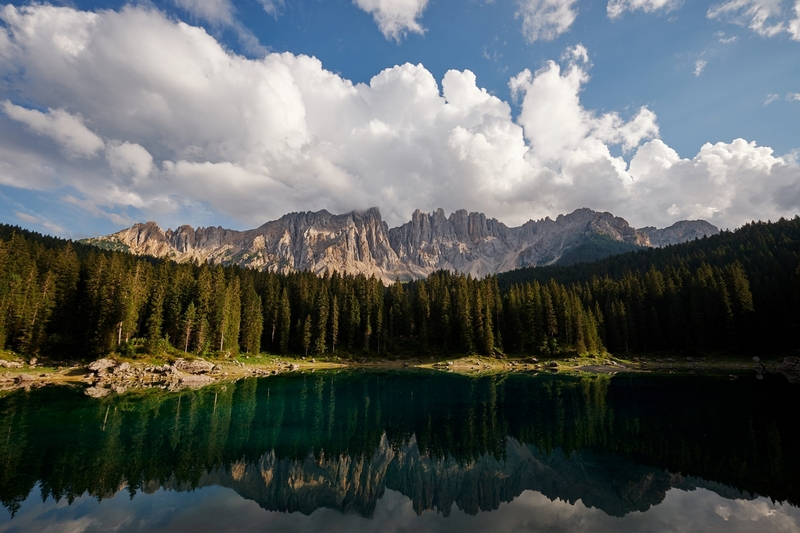 For those of you that don’t know about Carezza Lake… Well, it’s just one of the most famous lakes in the area, well known for its colors, its trees, its spectacular view. It is also very easy to reach. It is one of those locations where you just park the car, cross the road, and enjoy mother nature’s wonders. The lake is small, in ten minutes you can walk around it, but we spend a lot of time just admiring what we have in front of us. It’s just too beautiful to be able to write something about it. The greens, the blues, the majestic Latemar in the background, the perfect reflection… everything seems to be there to let every single person a spectacular shot. 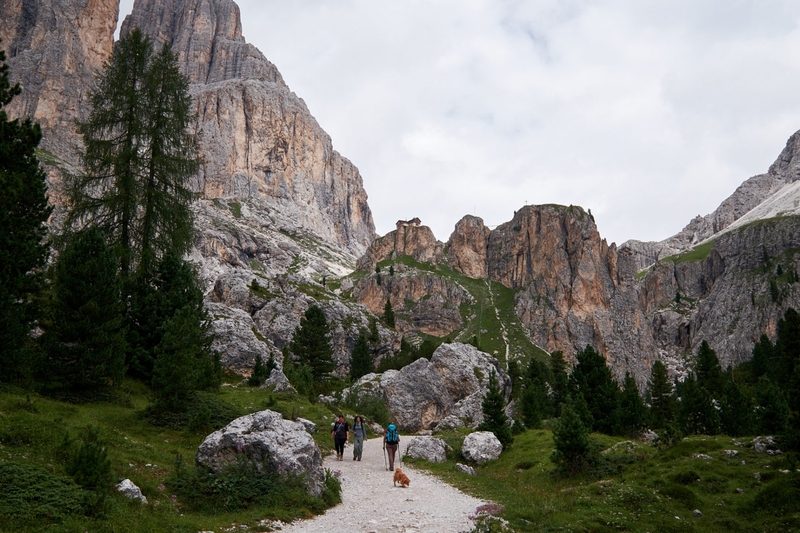 That’s it for today… another wonderful day in the Dolomites! NOTE: Unfortunately, Carezza Lake was severely damaged by strong winds and heavy rains during October 2018. Several trees fell on the ground eradicated by the wind, other were damaged. A lot of persons dedicated their time, tools, equipment, vehicles to restore the area as quickly as possible. It’s a pity but the inhabitants mentality is not to give up, to keep working harder and harder to restore the area to its original beauty. I strongly admire them. General Note: Some of the places shown in the posts from our Dolomites trip were dramatically hit by unexpected severe weather conditions at the end of October 2018. Strong winds and heavy rains damaged several woodland, villages and hiking trails. Images and descriptions on my blog refer to a trip we had almost 3 months before (beginning to mid August 2018). What shown in this blog may differ from what is the current status. I’m not aware of all the damages created by the weather, therefore this general note will be inserted in all the following posts. For those areas that I know for sure were damaged, I will point it out in the description.